It has been a long journey so far, but we are pleased to announce that Uniwheel is now available to the general public. Over the past year we have been evolving as a company, learning from our initial strides into personal electric transportation. Keeping a low profile has been a difficult decision to make, but one we felt necessary as to avoid any confusion or controversy that was not reflective of goings on. Developing our software – Not happy with our original software or the developments of our competitors, we decided to perfect ours. Using our own in house team software engineers we have been able to develop a far greater ride experience. And with a our team of test riders, we have been able to thoroughly review our software though thousands of miles of testing. Making sure its as safe and bug free as anything on the market. Growing up - Away from our product we have been developing and strengthening as company. From securing future supply chains to developing new product, we now have the structure and expertise to bring you new and exciting product innovations to a standard we can call Uniwheel. Getting ready for the future - As well as learning from our experiences we have been preparing for the future of electric transportation. Making innovations and product developments that capture the imagination of people, helping enhance the value of personal electric transportation as a whole. We understand that Uniwheel is not the most powerful wheel on the market or has the most range. But we feel it is one of the most considered toward daily use in urban environments, we see our current wheel as a city wheel, helping you join the dots of urban transport. 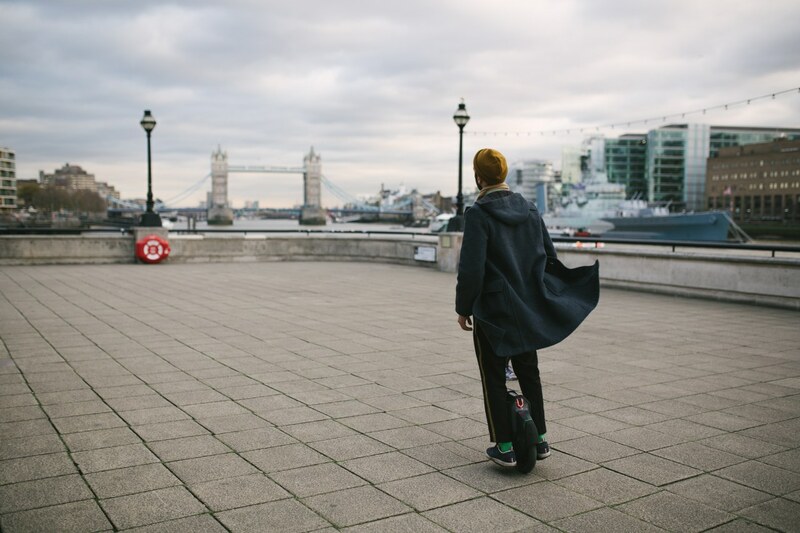 A wheel that fits in with that environment both stylistically and functionally. As well as focusing on the journey ahead we have had the time to appreciate the views of the current community. So in line with this, we have already made developments for the next version of Uniwheel that will address subjects such as range and speed. I hope this alleviates any suspicions or confusions you may have been having or have had about Uniwheel over the past 12-15 months. We would like to thank you all for being so patient over the last year, and we are glad to be firmly back in the community again. Do you guys have a website or any specs available? No max speed to be found anywhere on the site? In stock now or just pre-order? Just one pack, or 2 packs down each side? If one pack, the other side is the control board? Yes, it used to be published on the pre-order site but it is in the user manual http://uniwheel.co.uk//video/User Manual 16.03.16 V13no bleed.pdf 22km/h or 13 MPH. HOW FAST CAN THE UNIWHEEL GO? I’ll let @Uniwheel answer the stock question but the website shows the unit in 3 trim colours and all the ancillaries such as spare batteries, replacement covers, etc to be available. @Marty Backe will be so impressed with the 132 Wh battery size he will probably purchase 10 wheels, each one strategically placed along the route as he ascends Brokebacke Mountain. I wish you guys the best. If/when you release a model with at least ~800wh of battery capacity it could be a wheel that I would consider. I understand that I'm not your target market. st one pack, or 2 packs down each side? If one pack, the other side is the control board? As i understand it, this is one pack, which is connected by the 2 fat wires going over to the other side. I can see a market for this kind of wheel. I use my V8 exclusively for commuting right now and I charge it at work to maintain battery health. Each way is just 8-9km so the UniWheel would actually work for me and be a very light-weight option if I were transit hopping as I used to in London or would do in another major city with good public transport such as New York. Speed is not the fastest but again in the transit hopping urban environment most people will not want to be wearing significant protection if they will be on the train for 10-20 minutes between rides. Limiting speed is a wise move and 18-22kph is plenty fast enough for "naked" riding in crowded areas. My major reservation is not the battery capacity but its ability to deliver enough current to the respectable 1500W motor. Usually this requires parallel packs to spread the load which in turn means more capacity. What tech is being used to mitigate the risk of insufficient current supply to the motor from such a small pack? Huge caps? How much reserve can they provide? My only other reservation would be the lack of a trolley handle and I would strongly advise the Uniwheel team to look into creating a bolt on option similar to the V5. Even 22lb is heavy after a while and you can't always ride everywhere. I quite like this wheel for the usage it is intended. For those who what to ride further sometimes it would be a great second wheel. I'd love to upgrade my V8 to a KS18S but don't want to carry it up my apartment and work staircases twice daily. The 18S for recreation and a Uniwheel to commute would work. Price is high. But I will pay for quality and especially any redundancy if any is present. That remains to be proven. Isn't it, though, a 2014 design? LiFe Cells have very low internal resistance and hold voltage to within around 0.1V right down to around 10%, they also (ironically considering the phosphorus in them) have no tendency to catch fire so are way safer for airline flight etc. The downside, which is where all the capacity moans keep coming in, is that they are a significantly lower energy density, slightly lower voltage and are a damn sight more expensive. In practice a LiFe battery will perform like a Lithium Ion battery of 3 to 4 times the size in terms of power and will hold that power down to around 10% charge left. I would absolutely agree that 10.8kg is still a lot heavier than I’d be happy carrying, without a trolley handle. From a commuting point of view I wouldn’t dare try to ride my EUC through somewhere like Waterloo Station (just down the road from Uniwheel) and find my trolley handle hugely useful when walking it through a big space like that. I'm a good guinea pig for your purposes with my similar rationale for having those two wheels. I'd have been perfectly fine sticking with just the V8; you shouldn't feel like you're missing out on too much by not having a cruising wheel. We've got similar riding habits and I still think the V8 is close to ideal for those needs. I worry a bit about the battery wear I put on it as I charge it frequently. Even though I try to be conscious of good battery care, I wish it had a bit more capacity, not for the range, but so I wouldn't have to charge it quite as often. I like that the 18S takes a bite out of my V8 usage for that reason. I have to carry my wheel up stairs, too. The ride comfort of the 18S is such that it will cause me to want to use it even when the V8 would be more practical. The KS18 is more practical to carry up stairs than I'd originally thought. It's all in the ability to use two hands to carry it. I've got a carrying method where I support the wheel on my right leg as I go up the stairs with both hands and it's fairly easy. The seat doesn't get enough attention. It's more annoying than I expected that it's detached, but it basically gives you a pocket bike as well as a EUC. I know you've mention LiFe and the Uniwheel but I'd like to hear it from them to put this reservation to bed along with some specs such as the ability to keep that 1500W motor rolling. The used cells are Lifepo4.....These cells can deliver a crazy amount of amperage (up to 120Amps, depending on the cell), BUT, there nominal voltage is just 3,3 Volt (instead 3,6)with a max of 3, 6(instead 4,2). 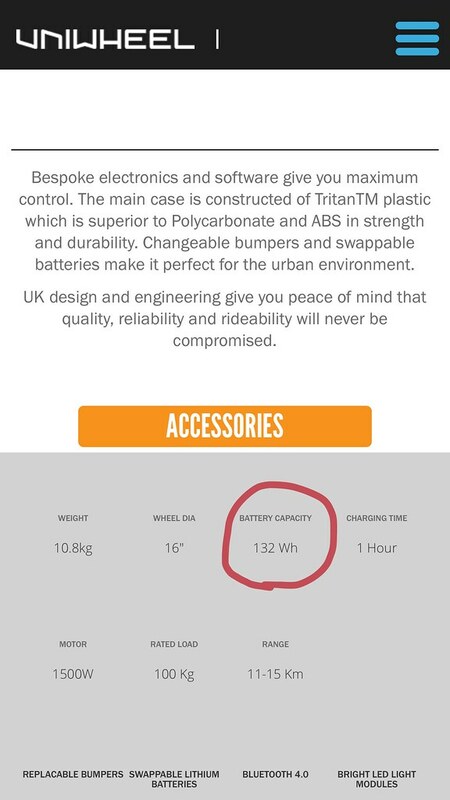 So my guess is they use a 1800-2200mah cell with 15-20cells ...to get to the 132wh announced. to keep that 1500W motor rolling. There's no way it's 1500W nominal, most likely 1500W max, as per old school EUC marketing. V8 is 800W nominal and 2200W peak. Random, but hadn't seen that mentioned before here. I love my V8 but the safety freak I am would like a 18" wheel, larger motor, and more parallel packs to spread the load. Sadly all of those come with more weight and bigger size. I'm not desperate to upgrade though. At 150lb I don't think for one minute I make the V8 sweat one bit. Well, good luck! Nice to see an Euro company entering this difficult market. But: urban usage = you need a trolley handle. Nobody is going to want to carry this thing through a pedestrian zone or indoors, vs. simple pushing it along with a nice trolley handle. That's the one big downside of the wheel, given what it's intended for. Can you tell more about the electronics? Specifically, any kinds of redundancy? This Uniwheel isn't what most people want. And even in its niche, the i5 exists and is a strong competitor (with imho the better form factor for carrying and daytime storage, and 2kg lighter). And towards the general market, what does it have over the KS14D other than 2.5 kg weight advantage and possibly the looks (and the 14D has that all-important trolley handle, and so many other advantages)? There have been lots of manufacturers who could have "won" the market, had they just done the obvious (at least in terms of customer wishes, not necessarily easy technical or financial viability, but sometimes not at all far-fetched) instead of apparently doing nothing and sitting on their asses, only to be overtaken by someone else. For example, we've heard the "but our software is superior" from Solowheel, too, and look where they are now - rebranding some other (old) model with no longer any own developments. Your information policy isn't the best (you really should easily be better than the Chinese companies in that respect! ), and sometimes it appears you're trying to target people who don't know any better instead of convincing the knowledgable ones with cold hard facts. Trying to sell noncompetitive wheels to anyone isn't going to work. This includes any PLEV hopes. What is the Uniwheel business model? I don't get the impression it's selling wheels. Selling/licensing the software and patents and whatnot? Hoping to get bought out as a (slightly belated) startup (maybe that explains the website, which doesn't seem to be targeted towards possible wheel buyers, rather company buyers/investors, with its generic and vague info)? As a step for something completely unrelated? This uncertainty creates doubt in what to think about the company and the wheel. Anyways, good luck, and hoping to see some reviews soon. Maybe consider sending some wheels out to some testers. And by God tell us and everyone all the juicy, nice details on where the Uniwheel is actually better. For their first effort, I think it looks great. Hard to compete with the Chinese companies on price, but the aesthetic of the uniwheel is appealing. I also like the modularity and affordable prices of the parts (OK, except the battery, but that may be attributable to other factors). I hope they can sell enough to stay in the game, because they have a good design and attitude. Until the aanswer.. some French journalists mentioned A123 2,5Ah cell / 52,8V battery after they tried the wheel. Also saying that these batteries where used in the Porsche 919 Hybrid LMP which won the 24 Heures du Mans in 2015. By 3,65Volt per lifepo4 cell that would be 16 cells, what i allready suspected. Could be -for example a "123a cell with 2500mah"
This 123a 2500mah cell delivers 70Amp continuous ....means 52,8 Volt with 70Amp = 3600Watt. So as our normal lion systems 60V-10Amp can only deliver 600Watt, so that more paralell setups are needed, here with the lifepo4 only one paralell system is absolutly no problem. That's actually great. They use seemingly "outdated" battery tech, but for a good reason (or to good effect): high currents in small battery packs. Why isn't this communicated? its more or less useless and worthless for our wheels..
With 2,5 volt x 16 = 40Volt....you are way to low under the usual 60Volt wheels nowadays! And voltage is still a very important factor when thinking about driving fast and avoiding back EMF which dont let you go fast then!